I’ve always been an active person – dancing, cheerleading, choreographing and teaching liturgical dance, and earning a 2nd-degree black belt in Tae Kwon Do (Dragon Kim’s, Edmond, OK). I came to yoga because of a neck injury. At the time, I didn’t know what a blessing that detour would be.Yoga changed my life – physically, mentally, and spiritually. I began practicing consistently in 2009. I received my 200-hour Power Yoga certification in 2013, studying with Kurt Johnsen (American Power Yoga, Dallas, TX) and Jayme Bushmiaer-Davis (now with Karmany Yoga, Dallas, TX). I became a Yoga Warriors International authorized instructor in 2014, and am honored to assist veterans, first responders, and others living with Post Traumatic Stress Disorder (PTSD) through this proven, life-changing approach to handling stress. Aerial Yoga is my newest yoga crush – so much fun and so strengthening! I love building connections with students and seeing them become happier, healthier, more loving and relaxed. My prayer is for YPY students to experience the joyful, lasting transformation yoga brings. Come as you are – large, small, happy, not so happy; leave better. It really can be just that simple. Yoga found me at a challenging time in my life – my husband and I were new parents who had moved to a foreign country with no friends or relatives. I was fortunate to live close to the YMCA where I took my first yoga class, and I was hooked. The practice not only helped me to keep my sanity, but it also made me physically and mentally stronger, introduced me to interesting people, and taught me to appreciate little things in life. I realized that yoga really worked for me, and I wanted to share it with others. I studied with Valerie Kit Love, Ph. T, E-RYT 500, and in 2005 became a registered yoga teacher. After numerous workshops and hundreds of hours teaching adults and children, I still enjoy the practice and learning something new every time I get on my mat. Today it helps me to stay grounded and manage my hectic life. Teaching Yoga for Kids classes are especially fun because children are natural learners, and they make you see the world from a different point of view – one that’s fresh and free of expectations. Kids live in the moment. Isn’t that the essence of yoga? Yoga is an art. Each pose is created by a practitioner every time. Just like Russian stacking dolls, it has many layers. Everyone can do yoga. It makes you face your ego, let go of expectations, and discover that you can do amazing things. Share your journey with mine. Namaste. I have enjoyed teaching this wonderful thing called “Yoga” since 2014 and absolutely love sharing all that I have learned along the way! I did; however, come into yoga nervous and graceless, with mean thoughts towards downward facing dog. I now continue with gratitude for the entire practice. Yoga provided me a sense of freedom from the arthritis I had grown up with. Throughout my practice I have fallen in love with the strength I’ve gained – and continue to strive for, both physically and mentally – always surprising myself along the way. I received my 200-hour certification as a means to deepen my own understanding of yoga. After teaching my first class I knew I had found my passion! While finding ways to deepen my yoga practice I found Pilates and became certified as a mat Pilates teacher through Balanced Body. My goal is for yoga to aid in our everyday “human moments,” whether that be breathing through anxiety, waking up without an achy back, or simply living more active and healthy lifestyles. I firmly believe every class should include awareness of our amazing bodies, along with ear-to-ear smiles. I started taking yoga seriously in 2013, five years after my undiagnosed shoulder injury. Yoga was the only thing that helped the injury and I wanted to know why. I was a dance student at a young age, and a belly dancer in my 20s. Dance and massage therapy have allowed me to see my yoga practice as something more than just poses. I see it as the way we honor our bodies by strengthening them and creating space between the muscles and fascia. My goal is to teach others how to safely practice yoga and how to listen to their bodies. 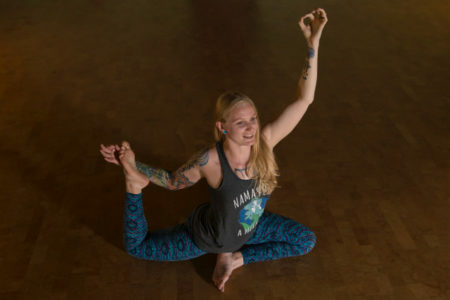 Each of our bodies has its own uniqueness and I find that yoga not only helps us understand and connect with that personality, but allows us to improve upon its function and reliability. Deep down I believe we can all heal ourselves if we listen. This is also my motivation for going back to school to be a physical therapist. My yoga journey began in 2010. I had been an athlete all through school and had continued to run and work out as an adult, but I wasn’t enjoying either of those things. I heard about, and tried out a yoga class near my home, and was amazed at how challenging it was on so many levels, and at the same time how peaceful it was. At first I was just determined to master the asanas, but as I practiced more and more, my focus began to shift. I became conscious of the deep connection between the mind and the body. I began to be purposeful about listening to my body and my thoughts as I moved through each practice, and discovered that yoga was healing on every level – mind, body, and spirit. I wanted to share that with others, so I received my RYT-200 hour certification through YogaFaith in Tacoma, Washington. I have enjoyed every moment of teaching this wonderful and ancient practice, and I pray that every student who comes to class will be strengthened and refreshed in body, mind, and spirit. Sometimes it’s amazing how life can completely circle around! I am a retired military member (I served my last tour as a Special Operations Team Leader) and found that because of that, my body was failing me way too soon. I took my very first step onto a yoga mat in 2013 at You Power Yoga. Ten minutes into class I knew that I had found what my soul was searching for and have spent numerous hours on and off my mat studying and practicing since! Yoga not only provides me relief from physical pain, but it teaches me to quiet my mind and to live with respect shown to my own limitations. Teaching yoga has given me the greatest joy: witnessing students realize that the mind, body, and spirit connection that yoga provides is tangible and attainable for anyone who reaches for it! In 2015, I completed my RYT 200 at Yoga Home of Therapeutics and my 500 hour at Awakened Life School of Yoga in Costa Rica. I’ve attained Reiki I and II Degree certification. I’m also certified through Yoga Warriors International to provide yoga to individuals and veterans suffering from PTSD, and have completed training in Self I-Dentity through Ho’oponopono Basic I through IZI LLC.